DMC has now launched a dedicated website for the NuGen™ BPA free syringe, which outlines the many advantages sought by the prefilled drug market in replacing glass syringes/vials. This entry was posted in Latest News from DMC Medical on August 14, 2017 by Carolyne Deer. DMC will undertake a major marketing campaign beginning in August 2017 for the Nugen™ syringe range. The prefilled drug market is seeking alternatives to glass syringes/vials with suitable polymers that are BPA free, chemical & lipid resistant with added toughness and glass-like clarity. 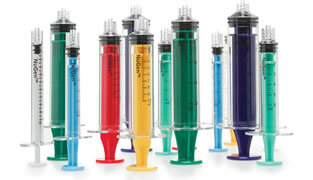 The Nugen™ syringe is a suitable and cost-effective alternative. DMC will target the major pharma companies in both Europe and the United States currently prefilling drugs and seeking a superior polymer syringe. The SureSafe™ 3ml automatic retractable syringe receives its first approval for the vaccination market in the U.S. This entry was posted in Latest News from DMC Medical on June 14, 2017 by Carolyne Deer. Enquiries increase for the BPA Free Nugen™ syringe with evaluation samples going to the United Kingdom, Turkey, Spain, Russia and the United States. Validations can take a number of months depending on what use the syringe is put to and the drug involved. This entry was posted in Latest News from DMC Medical on April 14, 2017 by Carolyne Deer. In collaboration with the materials science department of the University of Limerick and a leading materials scientist in the U.K., DMC is conducting a series of tooling and material experiments in the coating of syringe stoppers suitable for the prefilled drug market. This entry was posted in Latest News from DMC Medical on February 14, 2017 by Carolyne Deer. As a result of its classification as “reprotox 1B”, which entered into force in August 2016, BPA formally meets the criteria for identification as a Substance of Very High Concern. In December 2016, ECHA’s Member State Committee (MSC) agreed to identify BPA as SVHC, based on its harmonised classification. The California Office of Environmental Health Hazard Assessment (OEHHA) lists BPA under Proposition 65 Warnings. This entry was posted in Latest News from DMC Medical on December 14, 2016 by Carolyne Deer. This entry was posted in Latest News from DMC Medical on September 9, 2016 by Carolyne Deer. This entry was posted in Latest News from DMC Medical on April 18, 2016 by Carolyne Deer. This entry was posted in Latest News from DMC Medical on April 17, 2016 by Carolyne Deer. This entry was posted in Latest News from DMC Medical on April 16, 2016 by Carolyne Deer. This entry was posted in Latest News from DMC Medical on April 15, 2016 by Carolyne Deer. First deliveries of SureSafe™ to Carson CA in February 2016. This entry was posted in Latest News from DMC Medical on April 14, 2016 by Carolyne Deer. This entry was posted in Latest News from DMC Medical on April 13, 2016 by Carolyne Deer. PCT patent application for the SureSafe™ automatic retractable syringe range – June 2015. This entry was posted in Latest News from DMC Medical on April 11, 2016 by Carolyne Deer. FDA 510K approval for the Automatic Retractable Syringe “Options” in November 2015. This entry was posted in Latest News from DMC Medical on April 9, 2016 by Carolyne Deer. Pat Jones is appointed as Financial Director at DMC medical – April 2015. This entry was posted in Latest News from DMC Medical on April 8, 2016 by Carolyne Deer.